Of Silence is an interesting release on multiple fronts. It’s a collaboration between artists and labels but the 9 tracks are grouped into threes with each group featuring a different combination of the 3 artists that have worked on the material. It’s hard to explain but once you see it laid out in the credits it’s easier to understand. The compositions featured here are unsurprisingly of the quieter and avant garde variety. But I have to admit I really enjoy how these tracks are executed. There isn’t a lot of random fuckery or attempts at mundane high-brow humor. This is an intellectual foray into our idea of silence and how it can affect not only the aural atmosphere but also our psyche. Perhaps the first track that really grabs my attention, or I should say awakens my unconsciousness is Ben Link Collins’ With Silence. Collins has constructed a delicate ambience that has a very organic flow which evolves wonderfully over it’s almost 7 minute running time. Providing many dips in sound for personal contemplation. One successful attribute of the disc is that I notice is that it tends to affect the subconscious. There aren’t a lot of moments when the sound sticks out but it does set a definite tone which really hits the sweet spot here. 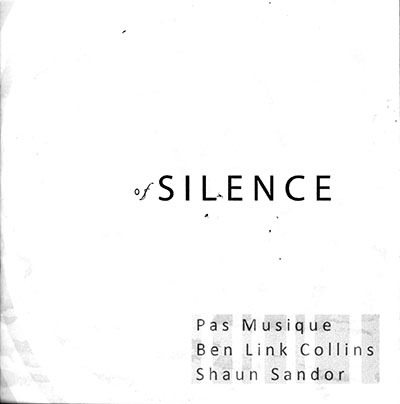 Another very successful moment is the track Over Silence which is the collaborative track between Shaun Sandor and Pas Musique. Getting out of the organic mode and more into an atmosphere or airy industrial textures it’s quite the change in direction but certainly a welcome one. Overall Of Silence is an album that has grown on me with each subsequent listen. There are many different compositional techniques that are very effectively employed here and it truly is a sonic journey and exploration that does just what it set out to do. The listener experiences silence in different contexts while also being exposed to various experimental ambiences and sounds that add different meaning to the quieter moments in the disc. Very well done.